Enjoy solid performance, beautiful images, flexible installation and lower cost of ownership. Part of the SOLID SHINE series of projectors, the PT-RZ475E Short-Throw LED/Laser DLP projector delivers high levels of reliability and long-lasting brightness that were previously unachievable with ‘conventional’ projectors. This market-leading short-throw projector offers maintenance–free operation for up to an incredible 10 years – making it ideal for long-running hour environments like control rooms. 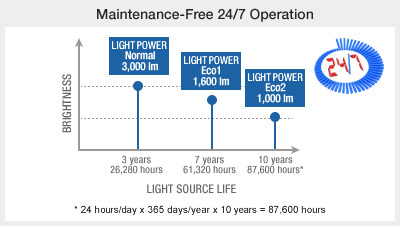 For 24/7 applications, it can bring 3 years of continuous use with the same exceptional picture quality. Designed for optimum rear-projection performance and professional integration, it comes complete with a multi-screen support system, portrait mode and 3D projection expand capabilities, while its DIGITAL LINKTM transmits digital signals up to 100m with a single cable. This new light source requires no maintenance for up to 10 years. * In many cases, this means no maintenance until your next refresh cycle. Naturally, there are no lamp burnout problems during use, so reliability is further increased. There is also no filter to clean due to carefully engineered sealed optics. As a consequence, running cost is dramatically lowered because of the savings on lamp costs, maintenance labor and hassle of stocking lamps. * With LIGHT POWER set to Eco2. Replacement of other parts than the light source may be required in shorter period. The rate of brightness deterioration in the LED/Laser-combined light source is extremely slow compared to lamp-based projectors. The SOLID SHINE drive uses a built-in sensor to constantly detect the intensity of the light source and correct corresponding changes in white balance. This all helps to maintain excellent picture quality for a long period of time. Contrast is outstanding too, at 20,000:1, and images are reproduced with a wide dynamic range. There is no maintenance required because the PT-RZ475 does not use a lamp or air filter. And it has an efficient cooling system and dust-resistant structure, and uses a DLP™ chip that has a long life. Together, this makes the PT-RZ475 ideal for 24/7 operation. For more information on the LED/Laser technology please click here. The short throw lens enables installation in tight spaces. For example, promotional images can be projected even in the narrow space of a retail store showcase, where image projection is not possible with a general-purpose lens. DIGITAL LINK allows transmission of HDMI, uncompressed HD digital video, audio and control signals (Ethernet, RS-232C) for up to 100 meters (328 feet) through a single CAT5e (STP) cable or higher. This simplifies cabling and system upgrades, making it ideal for ceiling-mounted and other permanent installations.